A lot of people believe that revenue and profit are the only KPIs that properly indicate the health of an online shop. Yes, it’s true that most businesses boil down to how much money they’re making in comparison to what they’re spending, but your strategy has to focus on the paths you take to get there, too. A few other metrics that can largely determine how well your online business marketing strategy is performing include conversion rates and traffic. Conversion rates: Pay close attention to landing pages, social media campaigns, and other traffic sources so you know how certain changes impact your conversion rates. Traffic: Although we’re more interested in whether that traffic is spending money, it’s also important to keep track of web traffic and where it’s coming from. Social media doesn’t make sales! While it might not be your first destination when you’re looking to buy something, social is still highly profitable when done right. In fact, 26% of Facebook users that click on ads they see on the platform end up making a purchase. Sales aside, you should be using social media to connect with your customers and provide glowing customer service, making people more likely to recommend your brand to others. By developing a strong social media strategy you capture relevant traffic and put your brand in front of audiences that previously may not have known about you. Email marketing is in the past! Email might be an old technology, but that doesn’t mean online brands and email marketing don’t go together. People still check their inboxes daily so it can be a great tool to connect with buyers. You should view email as a direct line to connect with customers, rather than a passive message that you hope they’ll see. Seasonal promotions, exciting launches, and end-of-season sales are all things that your subscribers might want to know about, so keep them in the loop with email. The goal of social media is to go viral! Going viral should be seen as a bonus rather than a goal. If your content does happen to go viral, you’d fly through your target audience in a day and not necessarily have the conversions you’d like to show for it. Content is more likely to go viral when it’s shared by an influencer, rather than by friends of friends of friends. For social media success, focus more on reaching new audiences and retaining existing audiences through targeted marketing and clever ads. You don’t need marketing if you have good products! 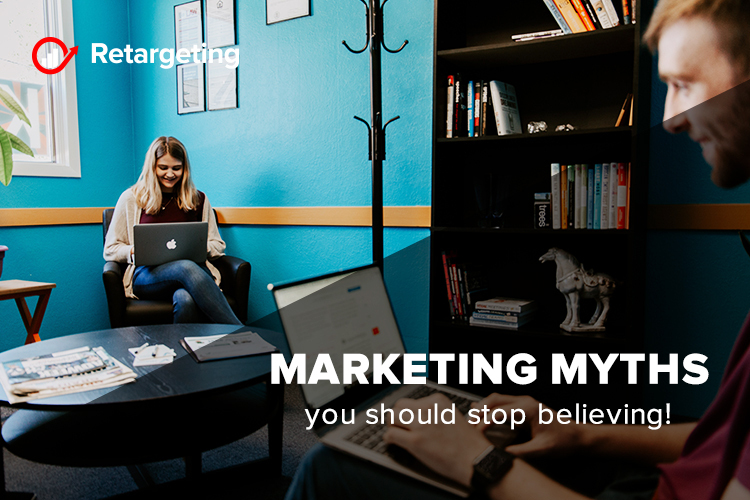 Your audience is exposed to so much information every day and they won’t pay attention if your marketing strategy isn’t well-polished and focused. While a quality product can make sales through word-of-mouth and positive reviews, it can’t reach the majority of your audience through these avenues alone. Existing customers are less important! It’s great to branch out and attract new customers, but it’s more cost-effective to sell to your current customers. You’ve already built a relationship with them and you know they enjoy your products. Actually, according to statistics is 7 times cheaper to retain an existing customer. A good way to stay relevant to new customers is to build loyalty programs, send them special offers and share exclusive content that is personalized to their interests. Present to a broad audience! Everyone’s different and you could be throwing valuable advertising dollars down the drain if you go too broad with your audience. Instead, pay attention to age, behavior, and demographics and use digital marketing tools like PPC and Facebook advertising to target the right audience. Try segmenting your audience to attract the right people and increase your ROI.